unlock-rar come dice il nome del programma, sblocca e rimuove la password dei file .RAR. Una soluzione giusta e rapida che riesce a sbloccare facilmente i file RAR quando sono protetti da una password e non riusciamo ad aprirli. Spesso capita di perdere la password di un vecchio file rar che abbiamo creato e protetto con la password. Senza la password saremmo costretti a cestinare il file in quanto non esiste alcun modo per recuperare la password. Ecco che unlock-rar ci viene di aiuto, rimuovendo definitivamente la password che blocca l'apertura del file. Whenever anybody goes through the hurdle with password protection, then his need to have a right solution that can immediately solve the issue. Yes we are talking about unlocking the RAR file that password needs to be recovered after lost. 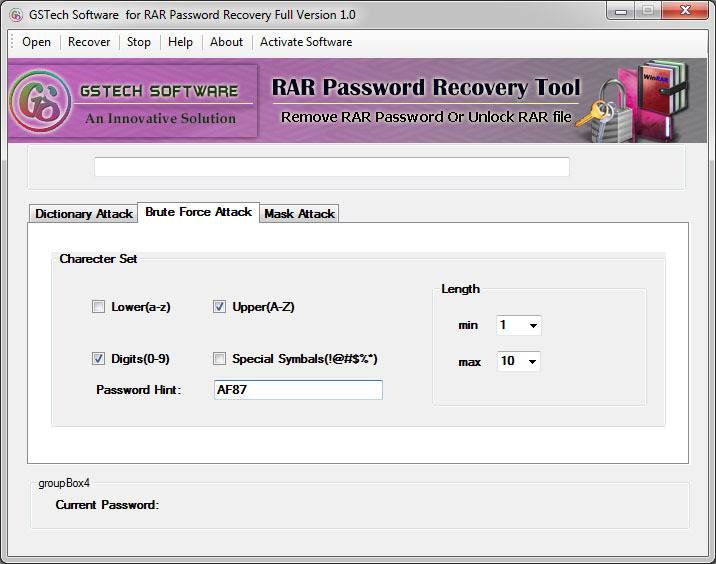 Here GSTECH worthy RAR Password Unlocker Tool kindly executes and tells how to open RAR file without password. Here this tool can perfectly unlock RARforget password by using marvelous technologies such as Brute Force Attack / Dictionary Attack / Mask Atttack, to open locked RAR files effectively. * Unlock WINRAR password with multiple combinations whether has symbols, numeric, alphabets, space, special signs etc. GSTECH genuine tool has availability of FREE demonstration, where user will get permission to view the starting three characters of the password at no cost. The user needs to remind lost password with these recovered characters. This demo is so much helpful for many users to convert demo into full score by guessing the password. But if this user is not able to guess password then obviously he / she needs to go with FULL version of WinRAR Password Unlocker Software to Unlock RAR lost password.